In all my years of reading articles written by some of the very finest in this noble profession called journalism, two articles are stuck in my brain like the hair planted on the scarf of the head. The first of these TWO articles….WHY I WILL NOT FORGIVE MY TEACHER, was written many years back by Dare Babarinsa of the then Newswatch. I still remember it as if it were yesterday, cramped in the popular Lagos Danfo bus on my way from work, shuttling between Oyingbo through Orile and finally to Okokomaiko where I shared a two-room apartment with my cousin. I had started reading the article out of boredom, little did I know that it would hold a lifetime influence on my literary reasoning. The said article, written in the days when the military held sway in the governance of this country, in summary, depicted the regrets of the average Nigerian who was advised by his secondary school teacher, however correctly, into attending the university as against going into the army to become an officer. It was a fairy tale of the young university graduate looking for a non-existent job or working with lean wages side by side his counterpart who went to the Nigerian Defence Academy, graduated, went for further training in India, UK, etc., got a good job with the prospects of even becoming a military governor or Head of State at a young age. While the university graduate always feared being treated like the bloody civilian that he was, the NDA graduate was above the law. The police dared not question let alone arrest him for fear of being administered military discipline. Then, all you needed to lose your girlfriend was to pay her a visit and find parked in front of the parent’s house a Toyota Celica with moving headlight, a young Captain is visiting, fresh from a UK trip. This young officer, six feet plus and carries a six pack just like you but he has something you only dream of, comfort, because he graduated from the NDA, and because he has comfort, he can even propose marriage to your girlfriend, something you dare not do as a young unemployed graduate. As the saying goes, that is the end of discussion. The second article, THE SHOES OF IMELDA MARCOS, was written by Onome Osifo Whiskey working with the then Sunday Times. I worked then on the sub-desk of the then Daily Times and I proof-read this article during production but only realized the import of the message carried by the writer when the late Dele Giwa offered Mr. Whiskey a job in his Newswatch saying, these words: “Those who can write as fine as this, should be writing for Newswatch”. In brief, Imelda Marcos was the wife of the disgraced Phillipino strongman, Ferdinand Marcos, whose wife Imelda, was reputed to have had the highest number of shoes on earth. The very foundation of these two articles was not merely just power but a show of it and how absolute power, as clearly enshrined in our military designed 1990 Constitution, can be applied, especially to perceived enemies. Someone wrote recently that President Goodluck Ebele Jonathan is a born again Christian. I sincerely agree with this submission because if I were President Jonathan, in line with my constitutional powers, General Olusegun Obasanjo, former President will be sitting somewhere in jail. I heard someone asked how? That person should seek General Sani Abacha and ask him how he did it because Obasanjo was already a former Head of State when he was clamped into jail and left to die. That he is bragging about him having contact with Boko Haram or being the only man alive in Nigeria that knows it all today is because Abacha dropped dead and the likes of Babangida and Abdusalami rescued and made him the hero that he is. It is only in this country that a former President assigns to himself the role of disparaging the very office he occupied from his Otta farm. 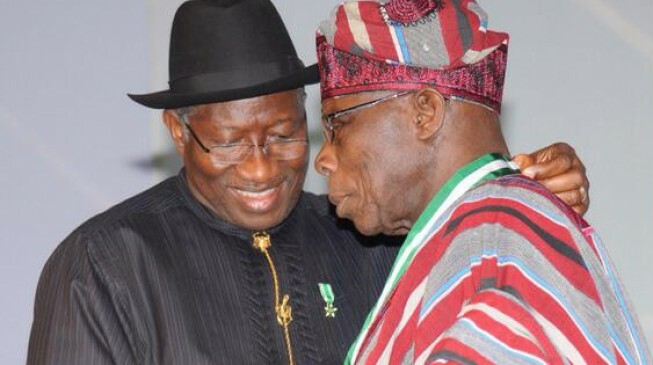 If there is anyone who can access President Jonathan, Obasanjo is number one but because Jonathan will never do his bidding at the expense of the generality of Nigerians, Obasanjo wants him out by every means, even using his suggested measures of ridding South Africa of apartheid then. It beats my imagination that in this moments of our grief, when our innocent daughters have been abducted, Obasanjo still openly admits that he is in contact with the abductors and waiting for President Jonathan to direct him before he can act appropriately. Would his position have been the same if he had one of his grand daughters amongst the abducted girls? The answer is NO. The painful aspect to this drama is that due to political differences and the desperate greed to wrest power from the PDP, mainly to have unrestricted access to the coffers of this country, the APC today sees Obasanjo as a saint. I am tempted to believe that some of our leaders see us, the led, as a bunch of idiots just because we have followed sheepishly. We are not, we are only being subdued by our fear of tomorrow. Am further amazed that Obasanjo has just woken up from his deep slumber of arrogance and suggested that Chief M.K.O. Abiola, may his soul rest in peace, be accorded some honour. Is it now that Abiola will be the messiah? Sometimes I think Obasanjo sees himself as God, I hope not. Someday and very soon too, Nigerians are going to take a roll call of those in the PDP and the APC and attempt to spot the differences. Your guess will be as good as mine…the same old song. If I were Jonathan, I will never lose sleep over the emergence of Sanusi Lamido Sanusi the former CBN Governor, as the new Emir of Kano. I will congratulate him and wish him well if that’s the wish of the people of Kano. There are so many traditional rulers in Nigeria, all of them enthroned by a sitting governor and to whom they must remain loyal. In Delta State alone, there are so many kings(emirs) and all of them with equal powers as the new emir. In Delta , you have the Olu of Warri, the Dein of Agbor, the Oroje of Okpe, the Odiologbo of Owhe Kingdom etc, all of them duly presented with staff of office as the Constitution demands by the Governor of Delta just as the Governor of Kano State has done to the new emir. Is there any basis for comparison between the new emir and President Goodluck Jonathan? Definitely not. The new emir should be allowed some relative peace to rule over the people of Kano, while Jonathan rules over Nigeria and all her traditional institutions. And for those who talk about the new emir’s indictment as Governor of the CBN, the law provides that the emir is innocent until proven guilty. My take here is, the law must be allowed to run its full course, there should be no sacred cow. My friends asked me the other day what will happen if the new emir is found guilty. To jail of course. Did Obasanjo not jailed by the emir’s kinsman from Kano. The whole world is watching how we navigate through this sensitive issue. Like I did advised before now, half a word is enough for a wise man. Let Jonathan be, in the interest of our continued unity because those pushing for his fall are doing so just to own oil blocs and live in abundance for the rest of their lives. We are wiser. *Owhefere is a two-term member of Delta State House of Assembly where he represents Isoko North Constituency.